What Good Is A Web Site Nobody Can Find? I Want My Website To Rank At The Top In Google! We hear this all the time from our customers in Berks County and all over the country! Let’s get straight to the point. No reputable web design and search engine optimization company will guarantee your website will achieve top organic search rankings. “Organic” is an important word which we will discuss in a moment. McQ Web Design does specialize in search engine optimization for small business websites with an outstanding track record of success. However, we are truthful with our clients, and take the approach of underpromising and over-delivering on search engine success results. There are far too many SEO scammer companies out there that promise the world, and fail to deliver. Take some peace of mind that we are not one of those companies. We won’t and can’t guarantee anything that we don’t directly control, and Google/Yahoo/Bing are not under our control. If you interview a web design firm that guarantees organic search engine success, this is not a reputable company. If a website client was participating in a “pay per click” sponsored ad campaign with a search engine, which allows the website owner to choose their desired keywords or phrases and pay a fee for each time a search engine visitor clicks the ad, that client can be guaranteed top search placement (temporarily). In return for top search engine placement, the website owner agrees to pay a fee every single time a person clicks on one of the sponsored keyword ads. This is NOT what most clients have in mind when they tell us they want to rank at the top! Instead, they want Google, Bing, Yahoo, etc. to rank them automatically at the top of a search engine search results page. This is called an “organic” search result, which has a zero “cost per click”, and obviously is highly desired by our clients. Most clients we speak to wish their website to rank really well in the search engines “organically”. We understand organic search results success. Achieving top 10 search engine rankings organically will mean much greater exposure for your website, potentially leading in huge gains in traffic and business! Attaining natural search engine results is one of the areas we do best! 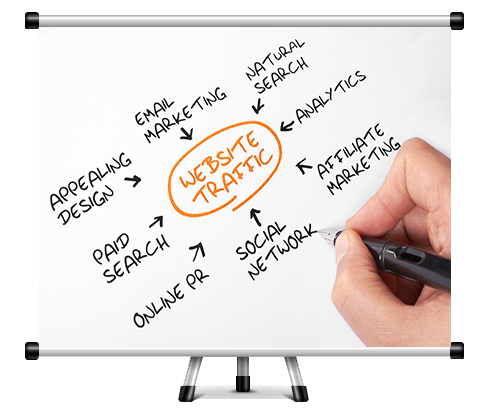 Achieving leading organic search result success requires planning and a solid website design. Unfortunately, many websites are set up to fail from the very beginning. We see may sites that lack the proper structure, and frankly, are poorly designed. Choosing the cheapest designer for your website is similar to choosing the cheapest foundation materials for a new construction home build. If the house’s foundation is not built solid from the beginning, the structure will fail, and the house will be unsound. In web design, if the original design is bloated with unnecessary code, lacks the proper link strategy, or just not built properly with the latest coding, the site won’t perform well. It is difficult to achieve top rankings for a website that is not built with search optimization at the forefront of considerations. Our philosophy is to over-deliver. We don’t talk a big game, we actually produce and you can see our search engine results success for yourself. We have NUMEROUS examples of taking websites from virtually ZERO rankings to top 10 search placement, and in some cases #1 search ranking placement! It can be done, and we have done it too many times to count! Every design firm has their own unique theory and recipe on how to build the site to help attract the search engines. As one of our design clients, you can be assured we start you off right with a search engine friendly framework and design, and then set the site up for optimal chance for success. Just as important, we will help educate you when it comes to managing your site and adding new content to enjoy more search engine ranking success for years to come.